In a few weeks, world leaders will gather in Paris to negotiate a climate change agreement that will frame the global agenda on this issue for the next decade and beyond. As a new Pew Research Center survey illustrates, there is a global consensus that climate change is a significant challenge. Majorities in all 40 nations polled say it is a serious problem, and a global median of 54% consider it a very serious problem. Moreover, a median of 78% support the idea of their country limiting greenhouse gas emissions as part of an international agreement in Paris. 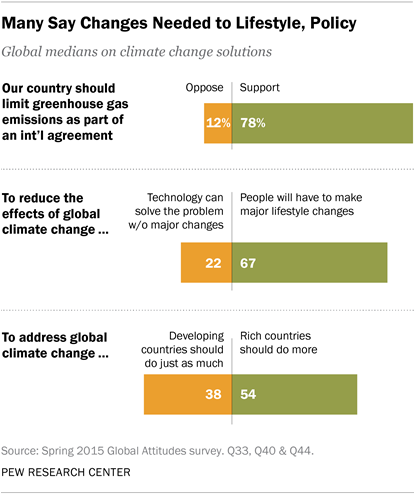 Nevertheless, there are significant regional differences on the perception of the problems posed by global warming. And Americans and Chinese, whose economies are responsible for the greatest annual CO2 emissions, are among the least concerned. (For more on global anxiety about climate change, see “Climate Change Seen as Top Global Threat”, released July 14, 2015). Climate change is not viewed as a distant threat. Across the nations surveyed, a median of 51% believe people are already being harmed by climate change and another 28% think people will be harmed in the next few years. More than half in 39 of 40 countries are concerned it will cause harm to them personally during their lifetime (the United Kingdom is the exception), and a global median of 40% are very worried this will happen. There is general agreement about what should be done to deal with global warming. As the Paris conference approaches, majorities in 39 nations (Pakistan is the outlier) say they support their country limiting its emissions as part of a climate accord. Even in China and the United States, where overall concern about climate change is less intense, large majorities support an international agreement to limit greenhouse gas emissions. However, according to most respondents, confronting climate change will entail more than just policy changes; it will also require significant changes in how people live. A global median of 67% say that in order to reduce the effects of climate change, people will have to make major changes in their lives. A median of just 22% believe technology can solve this problem without requiring major changes. Even in the U.S., a country known for its technological innovations, 66% believe people will need to significantly alter their lifestyles. In most countries, publics tend to believe that much of the burden for dealing with climate change should be shouldered by wealthier countries. Across the nations polled, a median of 54% agree with the statement “Rich countries, such as the U.S., Japan and Germany, should do more than developing countries because they have produced most of the world’s greenhouse gas emissions so far.” A median of just 38% believe that “Developing countries should do just as much as rich countries because they will produce most of the world’s greenhouse gas emissions in the future.” However, in six countries, half or more say developing nations should do just as much. Half of Americans hold this view, while 40% think rich countries should do more. Overall, there is little relationship between how wealthy a society is and its people’s views on this question. Still, despite considerable agreement on many climate issues, there are also important differences between regions and countries, and often, within nations. 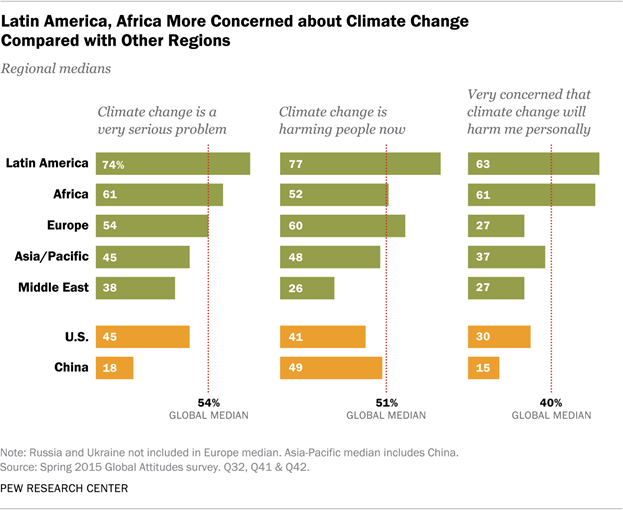 Concerns about climate change are especially common in Latin America and sub-Saharan Africa. However, they are less prevalent in China and the U.S., the two largest greenhouse gas emitters. For instance, just 18% of Chinese and 45% of Americans say climate change is a very serious problem, compared with a global median of 54%. Similarly, while four-in-ten around the world are very worried that global warming will harm them personally, just 15% in China and 30% in the U.S. share this fear. Overall, people in countries with high levels of carbon dioxide (CO2) emissions per capita tend to express less anxiety about climate change than those in nations with lower per-capita emissions. 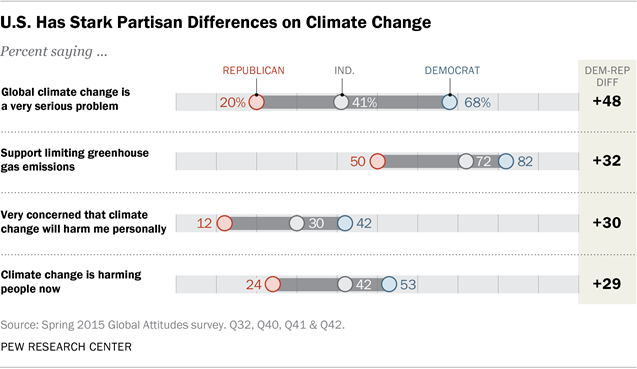 In a number of societies, views about climate change divide sharply along partisan lines. This is especially true in the U.S., where Democrats are much more likely than Republicans to see climate change as a problem, to believe its effects are being felt now, to think it will harm them personally, and to support U.S. participation in an agreement to limit greenhouse gas emissions. (For more on U.S. views about climate change, see “Public and Scientists’ Views on Science and Society”, released on January 29, 2015). But the U.S. is not the only country with notable partisan and ideological differences. In other economically advanced nations, such as Australia, Canada, Germany and the UK, those on the political left are significantly more likely than those on the right to view climate change as a major threat. These are among the key findings from a new Pew Research Center survey, conducted in 40 nations among 45,435 respondents from March 25 to May 27, 2015. People around the world are concerned about a variety of possible consequences of climate change, but drought tops the list. Survey respondents were presented with four potential effects of global warming, and were asked which one most concerns them: droughts or water shortages; severe weather, such as floods or intense storms; long periods of unusually hot weather; or rising sea levels. Drought is the most common response (or tied for the most common response) in 31 countries, including the U.S., where 50% say this is the possible effect that concerns them most. Fears of drought are particularly prevalent in Latin America and Africa – in both regions, a median of 59% say this is their top concern. 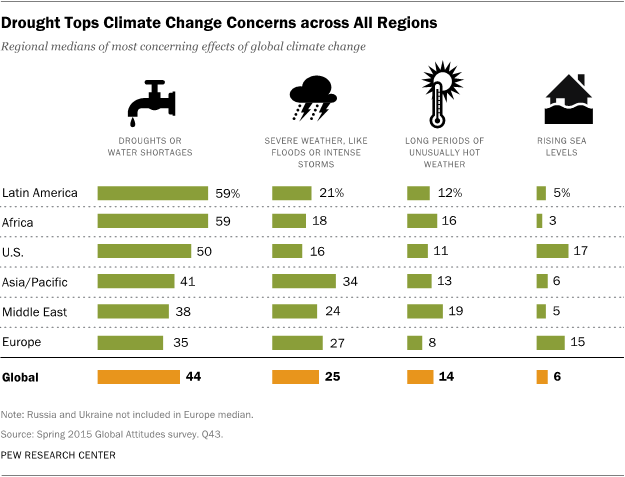 Globally, a median of 44% cite drought as their greatest worry with regard to climate change. Many are worried about other consequences as well. Across the nations polled, a median of 25% say severe weather is their chief concern, and in Asia-Pacific the median is 34%. Severe weather is the number one (or tied for number one) issue in eight nations. Meanwhile, Indonesians, Nigerians and Malaysians identify long periods of hot weather as a top concern. There is no country in which rising sea levels are the top choice, though roughly one-in-five or more respondents name this as their primary concern in France, the UK, Japan, Australia and South Korea. 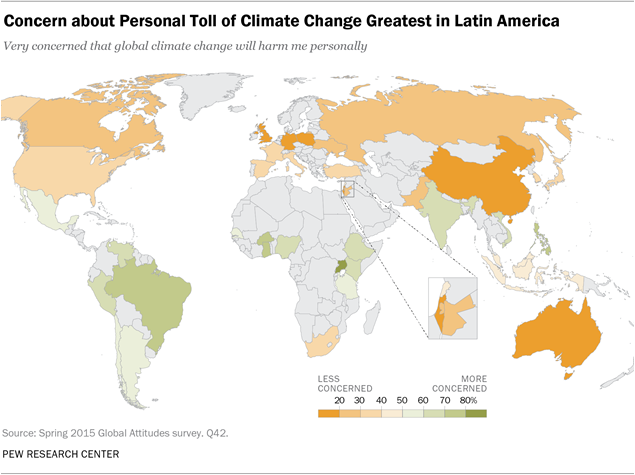 The degree to which people fear climate change will affect them personally varies substantially across the globe. The share of the public saying they are very concerned it will personally harm them during their lifetime ranges from less than 20% in the UK, Australia, Germany, China, Israel and Poland, to more than 70% in Uganda, Brazil, Burkina Faso, the Philippines and Ghana. Views about climate change break sharply along partisan, gender and generational lines in the U.S. Democrats are much more concerned than Republicans about this issue, much more likely to believe the effects of global warming are already being felt, and significantly more likely to think they personally will be harmed by climate change. Additionally, American women are far more concerned than men about climate change (51% of women see it as a very serious problem vs. only 39% of men). They are also more likely to believe it will affect them personally (36% very concerned vs. 23%) and more likely to believe major lifestyle changes will be required to deal with the issue (75% to 57%). Young Americans are generally more concerned than their elders about climate change. Americans ages 18 to 29 are significantly more likely than those ages 50 and older to see global warming as a very serious problem (52% to 38%), to believe it will affect them personally (34% very concerned vs. 21%), and to support U.S. participation in an agreement to limit greenhouse gas emissions (85% to 60%). Younger Americans are also more likely to think rich countries should do more than developing nations to address this problem (51% to 34%). The partisan divisions found in the U.S. are reflected in several other relatively wealthy democracies. Some of the greatest partisan differences exist in Australia, where disagreements over global warming within the ruling, right-of-center Liberal Party contributed to the 2015 ouster of Prime Minister Tony Abbott and his replacement by Malcolm Turnbull. Just 31% of Liberals expect global warming to harm them personally, compared with 65% of Labor Party supporters and 72% of Greens. Similarly, only 44% of Liberals think rich countries should do more about climate change than developing nations, while 54% of Labor and 67% of Greens want wealthy societies to bear more of the costs. 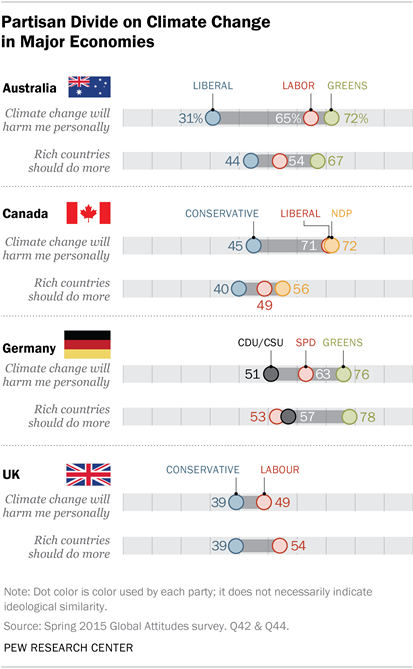 In Canada, Germany and the UK, followers of conservative parties are also much less likely than followers of liberal or green parties to believe they will be harmed by climate change. And in Canada and Australia, supporters of conservative parties are less likely to think rich nations should do more than developing countries to address this issue. Meanwhile, in Germany, adherents of the Green Party are significantly more likely than those of both the right-of-center Christian Democratic Union/Christian Social Union and the left-of-center Social Democratic Party to expect more from rich countries. Catholics, along with people who are unaffiliated with major religions, are more likely to agree with the pope’s position than are Protestants in the U.S. Among American Catholics, half believe climate change is a very serious problem and 39% are very concerned it will harm them personally. 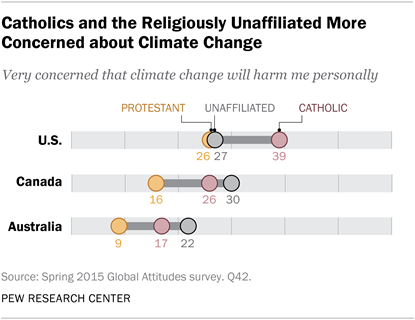 Only 34% of Protestants are very concerned about global warming, and just 26% express strong concerns that it will harm them in their lifetime. Notably, Pope Francis also wrote in his encyclical: “We must continue to be aware that, regarding climate change, there are differentiated responsibilities.” But on the issue of whether rich countries should do more than poor ones in combatting global warming, there is no statistically significant difference between the views of Catholics and Protestants in the U.S., Canada and Australia.